Goblins are not the tidiest or most subtle of creatures. The approaches to their lairs are littered with evidence of their presence. Use the list below, to generate minor features of interest the PCs could discover outside a goblin lair. Yellowing bones are tied to the branches of a stunted bush growing nearby the entrance to the tribe’s lair. Tied onto the bush with ribbons, bits of twine and thin strips of leather the bones clack together in the breeze. A gallimaufry of tracks mars the ground. Scraps of broken equipment lie scattered about. Scorch marks mar several trees in the immediate vicinity (showing where the goblins have practised with fire). A deep, wide fire pit has been dug into the ground a score of paces from the entrance tunnel. Ash and fragments of burnt wood fill the hole and on windy days, the ash fills the air like a fine mist. Inquisitive PCs also find bones of several animals (probably horses or ponies and suchlike) buried amongst the ash. A fallen tree lies across the obvious trail leading to the goblin lair. Perceptive PCs can spot the tell-tell signs of tracks behind the tree, suggesting the goblins sometimes keep watch here for intruders. A rudimentary campsite lies amid a small stand of trees filling a nearby hollow. The slashed and bloody remains of several tents still flap listlessly in the breeze. Nothing of value remains at the site, which appears to be at least several months old. Crude paintings of humanoids with big ears carrying wicked knives and serrated swords decorate several boulders. The artwork is simplistic at best. About 100-foot from the lair, the beginnings of a pit block the trail where it passes between two large boulders. Nearby are cut tree branches and a pile of leaves (or other suitable camouflage) destined to cover the pit when it is finished. The pit is only about three-foot deep when discovered. A mouldering goblin corpse lies on its front, partially hidden from view. A serrated dagger juts from its back. The corpse has been comprehensively looted of all valuables—even its shoes have been stolen—but the killer could not remove the dagger as it’s tightly wedged between two bones. A large tree—much bigger than its companions—looms over the approaches to the lair. Perceptive PCs spot a knotted rope hanging down from its trunk and a small (currently unoccupied) observation platform built high up amid its branches. Is it the breeze making the knotted rope sway gently or has a goblin sentry recently rushed to warn the tribe of the party’s approach? 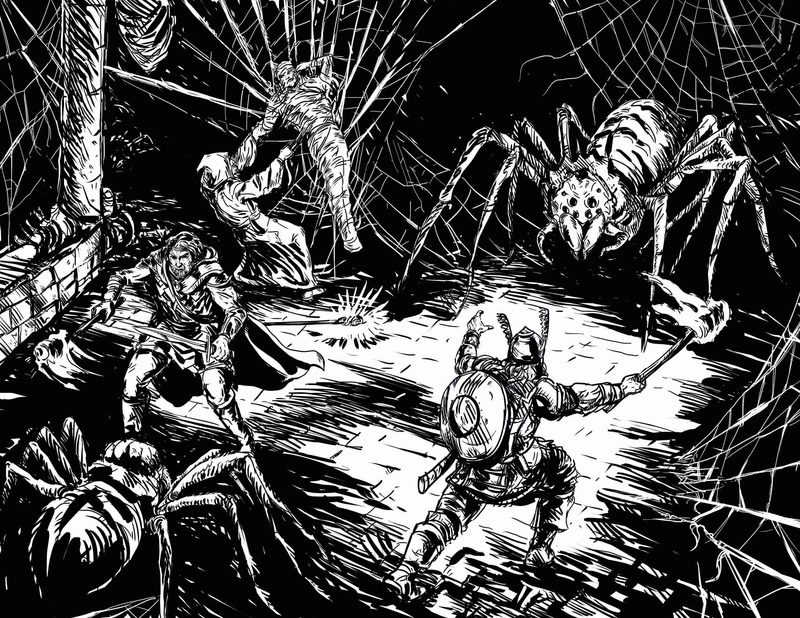 This articles appears in 20 Things #17: Goblin Lair. Another useful table for any rpg that includes goblins! Over on G+, I have started a collection of all things goblin and your tables are just about the most important part of the collection! My next adventure involving goblins is going to be epic thanks to you! Thanks, Michael! I’m glad you’ll enjoy the table. I hope your players do as well!